"What the heck am I going to do with all these vegetables?" "Just who thought it was a good idea to plant all this squash?" "Did we really need 37 tomato plants? "How on Earth did I forget to celebrate "National Sneak Some Zucchini onto Your Neighbor's Porch" night?" If you missed the opportunity to celebrate on August 8th - or have neighbors who take a dim view of trespassing, here's a tasty alternative. Use your extra squash, zucchini, and peppers and whip up a batch of "Late Summer Refrigerator Pickles." After one taste of these sweet treats, your neighbors will be begging for more. No boiling water bath required! The downside is that they must be kept refrigerated and only keep for a couple of months. Of course, ours never last longer than a week or so. They make a great snack or side dish on a hot summer day. The recipe is really flexible. Basically, you need about 10 cups of your favorite vegetables. 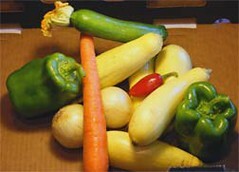 For this batch, I used the morning's garden harvest of squash, zucchini, and peppers â€“ which is pictured here. I also tossed in some sweet onions for flavor and a carrot for color. Earlier in the summer when we had lots of cucumbers, but less squash and peppers, I substituted some cukes for zukes. And sometimes, I slice some hot peppers and toss them in to make a good, spicy mixture. Pour the sugar and cider vinegar into a saucepan and heat gently until sugar is dissolved. Turn off heat; don't let the mixture boil. Place vegetables in a large bowl, sprinkle with pickling salt and dill. Mix well. Set aside for about ½ hour. 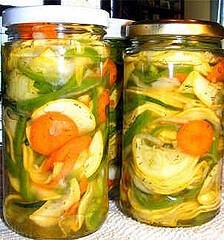 Gently pack vegetables into clean glass jars. Pour sugar/cider mixture into each jar to completely cover vegetables. Cap tightly and refrigerate for 1-2 days before eating. These keep for several months in the refrigerator. The original recipe said they keep 2 months, but they've never lasted that long in our house! Note that you don't have to use traditional canning-type jars. Because these don't go through a water bath or pressure canner, any tight-fitting lid will do. I save small jars throughout the year and use them in the summer for refrigerator pickles. They make great gifts for friends and neighbors and are welcome at all potluck dinners! Finally, if you're looking for more ways to preserve your summer bounty, the book I referenced earlier, "The Big Book of Preserving the Harvest," is an excellent resource. It has chapters that explain how to can, dry, or freeze foods, make jams and jellies, pickling, and even hints on packing food as gifts. Every chapter contains recipes and safety tips.